Information about food, especially as it pertains to health. Max bodyfat you can burn in an hour is roughly 1 gram per 10 pounds, or in calories, 9 times your weight in pounds. Anything else is food, muscle glycogen, or actual muscle tissue. Glycogen max is about 4% lean muscle mass, which usually is enough for 90 mins, plus or minus. Food is whatever is in your gut, though exercise slows digestion. Bonk is when you have used up all food, and your glycogen stores, effectively exercising while fasted. Bonk power is the max sustained energy ouput when you are fasted/bonked. This is fat burn, and muscle breakdown, combines. Average watts is roughly 1/4 your calories per hour. I’m 280 pounds, and bonk power for me is 133 watts, which is about 520 calories per hour. Doing that pretty much guarantees cramps from muscle breakdown. Biking, I tend to burn 750-850 calories per hour, but I can peak at over 1000 in some instances (beginning, well fed, well rested, very driven). That’s a big gap, because being big, I get more wind drag, which is 50% of your energy above 15mph. I also take more energy to climb a hill. Downhill is faster, so less benefit (less time spent going downhill), and often waste the energy by riding brakes so as to not plow through others. I do best consuming 600 calories per hour while riding more than 90 mins. So, I have to eat the equivalent of a meal every hour to keep up, and reduce cramp risks. Most of that needs to be carbs that break down in less than an hour. Also, I don’t want to have a bathroom break every hour. Sugary colas have phosphate, glucose, and fructose – all good for refueling. Cookies, sandwiches, etc usually are low roughage, good energy density, and include salt. M&Ms were actually designed to be endurance fuel for the army, and they hold up pretty well in a plastic bag. Basically, all the things that are bad for you normally make great endurance fuel. As to proper “race fuel”, honestly, it’s too low calorie for someone my size. Some people only need 200 calories an hour to stay fueled, so half banana, a 2″ square of granola, and a swig of gatorade is fine. For me, that would be a whole bunch bananas, and two quarts of gatorade. Just too much bulk. Add to all that the need for oxygen to build ATP (actual muscle energy chemical). It takes 35% more oxygen to burn blood glucose than intra-muscular glycogen. Fat takes twice as much oxygen as glucose. High heat, humidity, low pressure, altitude, carbonation, and alcohol all reduce oxygen availability. Transport of glucose into the cell takes ATP. Digestion of food takes ATP. The key there is to not eat much carbohydrate outside of the exercise times. When glycogen reserves are full (muscles recovered), and adipose cells are replete, then why would you need more fuel? That’s the practical wording of the physiology here, despite the perception of a faulty hunger mechanism for the obese, or lack of islets for type I, or the defective signalling in Type II without obesity triggers. While glycogen is being replenished, glucose uptake by muscles in normal. GLUT4 is transported to the membrane during exercise, even in absence of insulin. * Eat before I get ravenous (around every 2 hours). * Try to keep a reserve of about 25% of my calories for the evening. * Don’t be TOO aggressive (20% deficit is okay, but 40% is not). * Keep extra servings away from my plate/bowl. * Split up snack/mini-meals when I’m not hungry. * You have to exercise, because your body will reduce your BMR to keep from losing fat reserves. * Hungries are worse the day AFTER exercise, so save your calories for tomorrow. * Lots of broths, leaves, fresh veggies to add bulk, and fill in when I’m STILL HUNGRY! * Make sure I get the food groups and vitamins daily / weekly rather than every meal. * UMAMI: Your tongue creates Peptide YY it detects meat, glutamate, etc. Reduces hunger by 30% in the lab. * VITAMIN A: Hunger hormones are produced by fat cells. Empty fat cells do not get recycled without Vitamin A. * VITAMIN D: Vitamin D is blocked by Vitamin A, and is deficient for many indorsy people. * CALCIUM: Requires Vitamin D to be absorbed. Prevents brittle bones. Some days will be better than others. Don’t give up. Keep tinkering. Sharon ran across a recipe that looks amazing. It is very similar to my mom’s recipe, except they use melted butter in place of the oil+butter_flavoring; and they use twice as much icing. In a large bowl, cream the butter, shortening and sugar until light and fluffy. Beat in egg yolks and vanilla. Combine flour and baking soda; add to creamed mixture alternately with buttermilk. Beat just until combined. Stir in coconut and pecans. In a small bowl, beat egg whites until stiff peaks form. Fold a fourth of the egg whites into batter, then fold in remaining whites. Pour into three greased and floured 9-in. round baking pans. In a large bowl, beat cream cheese and butter until smooth. Beat in confectioners’ sugar and vanilla until fluffy. Stir in pecans. Spread frosting between layers and over top and sides of cake. Store in the refrigerator. For reference, Here is my mom’s recipe, slightly annotated by me. She kept it on a 3×5 card in her recipe box, but it might have been something she got from her mom. Add 5 yolks (emulsifiers), one at a time, and stir after each one. Pour equally into 3 round 8″ cake pans. Bake for 20-25 minutes at preheated 350 degrees F.
Cool icing by placing pan/bowl in cold water. Once the cake is out and cooled, spread the icing between layers, then on the top and sides. Let set up overnight in the fridge. Note: Individual slices freeze very well and are extremely tasty while still frozen. 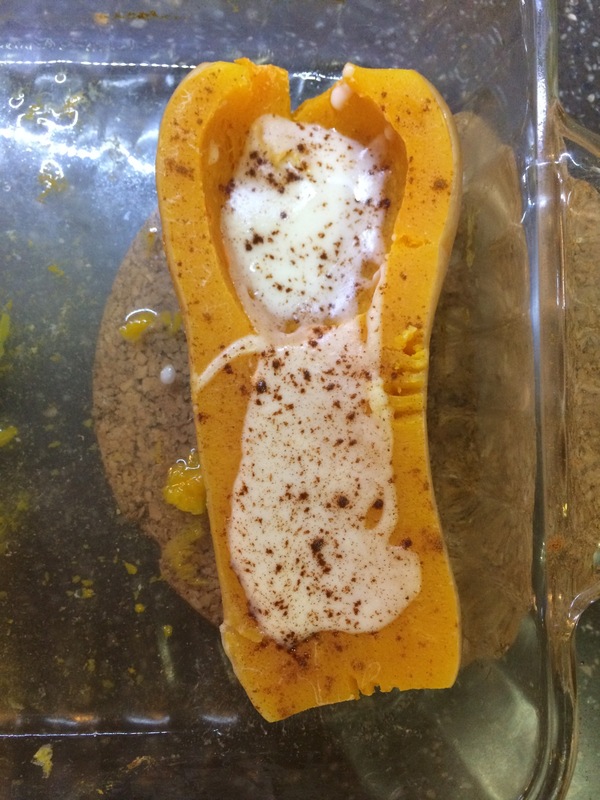 Butternut squash with coconut butter and cinnamon. Best food ever. TYVM slavetrunks, I mean Erica! Unfortunately, I’m apparently developing a mild allergy to coconut. I have a very slight case of pharyngitis from sleep deprivation, and the pureed coconut texture is the same pattern of sensation as the sparkles I feel since having consumed it with supper. I better back off, because I love coconut. Don’t want to ruin grated, chunk, and candied coconut just for this magical elixer I’ve survived without until now. Posted in food, xaminmo | Tagged allergy, coconut, food, squash, supper | Comments Off on Tasty! Ride to Sanger with the Sharon group. I was 22 mins late leaving the house, so I told them not to delay the start time. They waited 5-6 mins for me at Hwy 377 and Bonnie Brae. It was a hard push to catch up, and Sharon pushed hard once I got in sight. Unfortunately, this sort of punished/burned out some of the others as well, especially Jim F. Jim tried to hang on, but at the end he finally admitted he needed to work his way up to this length of ride. He completed it, but with our waiting, it was 2-3 hours extra. That being said, for being about 3 months post-op for hip replacement, he’s doing awesome. Becky took the SAG wagon back from lunch because of other committments. Karl took it because he broke a drive-side spoke in the middle where it’d been notched by the chain about 2000 miles ago. Karl, Jim and I went for a quick spin. Pretty muggy out there, but the temps were nice. We started early, and rolled about 7:05am from the AMC pond, and about 6:50 from my back gate. Ended up a little further than we planned, but was good. Wind was brutal. This was a pretty hard push to only get 16.2mph. Average watts shows the truth. I stayed near the front for much of the second half of the ride, but I was never far ahead. It’s more of the initial power-up rather than a massive difference in power. Looking over the last few months of Garmin history for rides over 20 mins and 5 miles, this is my highest average wattage (214 vs 207) by 7 watts, but only my second highest max-average-watts (244 vs 258 highest 20-min average during the ride). I also had actual breakfast – 2 mini sausage-biscuits (300kcal) and 3 six-inch pancakes (about the same). No syrup or butter. Powerade full-strength in one bottle, and half plus sugar-free green tea in the other… plus 20oz of gatorade mid-ride, plus a fried pie mid ride. It was 20 miles in before I opened the first bottle, but I’ve been pretty well hydrated lately. I definitely felt the slowdown before beginning the rehydration. I was short on sleep, and had Advocare MNS Max E (though I didn’t have the CorePlex, the probiotic, nor the Omega. I added a single OptiMen multi tablet, and one TwinLab TriBoron Plus calcium). The MNS E is caffeine laiden, and I felt very alert. Perceived exertion seemed lower than expected, but it was still very obviously a hard push. The ingredients all look to be okay were I in a UCI race, but I can’t help but wonder about metabolites, etc. I couldn’t find anything on the USADA or WADA websites on labs for testing. They specifically don’t test supplements. More research is warranted. Just a jaunt over to lunch with Mark, Rob and Scott. Lots of discussions about rights, racketeering, police brutality, religion, etc.